Confused and buggy, but very entertaining under the right circumstances. Bring friends. In Magicka, you're a wizard. You've got eight elements that you can stack up, mix, multiply, and unleash. You can cast them at goblins, cast them at anything next to you, cast them at your specially blunted sword, cast them at your own face. Singleplayer mode is a light comic fantasy, narrated by your dodgy mentor, Vlad. The black-clad Romanian wizard keeps pointing out that he's not a vampire, and making bad puns about sinking his teeth into things. It's a mix of satire and pop culture references that'll have you smirking dangerously throughout. Lots of care has gone into the way the elements combine and contort in your spells. Combinations shape the form (Missile? Beam? Cone? Wall?) and function (Healing? Burning? Shielding? Exploding? Freezing? Drenching? Zapping?) of each glorious experiment. There's enough variety for every wizard to have his or her own favourite attack style. Mine is a steamy lightning beam that scalds you before dealing bonus lightning damage from the water element in steam. Concocting these spells is a little confusing at first, as you're commanding eight elements across eight keys, but you're rarely faced with enemies that can't be killed by particular elements. Button mashing will get you far, and a mistake might just surprise you. The environments are top-down, linear jaunts through bright and breezy fantasy tropes: forests full of goblins, orcish trenches, swamps, mines, the land of the dead. Wander off the beaten path, and you can find powerful equipment and new magic spell recipes that reach beyond the scope of your regular elemental concoctions - spells such as Revive and Teleport. Singleplayer will soon wear thin, sadly. It's not that you can't beat it with the right spells and an awful lot of goes – it's that if you make a mistake and burst like a sticky water balloon, you get chucked back to the last checkpoint you reached. In once case, that involves fighting three big groups of face-pounding orcs and one-hit-smash-to-deathing ogres, in a row, before you hit another checkpoint. If you quit before you complete that level (perhaps out of, ooh, say, frustration), you'll have to start it all over again when you boot up the game again. Ultimately, you'll hit this annoying boss or that overpowered yeti thing or this boring underworld level and you'll just give up on singleplayer. Then you'll turn to multiplayer. And multiplayer is good, when it works. 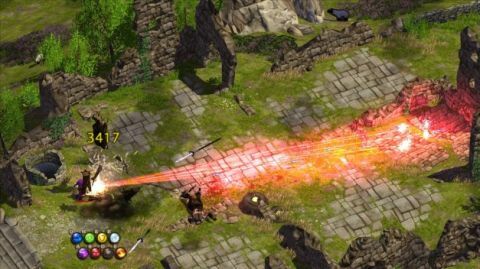 If you've got a few networked computers and three eager friends with Magicka on their Steam accounts, you can enjoy the splendour of four death lasers combining neatly into a super-beam that bursts ogres in seconds. You can have tactics and gambits and laugh as they end with one wizard left, deciding if he wants your gear before he resurrects you. The bulk of us, however, will be butting our heads against the brick wall of online multiplayer. At the time of writing, developers Arrowhead have been releasing patches every 24 hours, and they're gradually improving on the terrible connectivity issues. Despite their efforts, you no sooner host a game than Steam Chat dies, Skype calls drop, and flatmates start inspecting the router for flashing lights. For a game so reliant on multiplayer to be fun, there are lots of missed opportunities. There's no chapter select function, no joining mid-session for latecomers or disconnected players, no voice chat, no dedicated servers, and tons of lengthy, wordy cutscenes that only the host can skip. Get it working, and it's great. For £8, you'll get your money's worth before everyone forgets about it. But it could have been game of the year material! Silly wizards.